A little over a week ago, I blogged about the inherent scariness of twins, citing the movie The Shining as the perfect example. They came back to haunt me. I was in Pittsburgh on business Friday and stayed at The Priory Hotel, a former Benedictine Monastery that is now a 25 room European-style hotel on Pittsburgh’s North Shore. 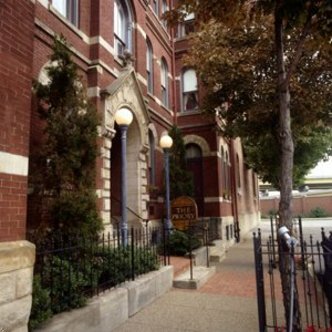 I chose it because it was within walking distance of not only my meeting but the Warhol Museum, and I hoped to pay a visit after my business was finished. Due to travel delays, I didn’t get to my room until almost midnight. When I went to bed, I lay down facing the room door where I saw, through the light streaming in, two feet standing outside the doorway. I got up, crept to the door, and peered through the peephole. No one was there, but the distorted view of the hallway — with its ancient wallpaper and crown molding — gave me an instant Shining flashback. The twins weren’t there, but they might as well have been. I was thoroughly spooked. All the period details of my room went from charming to creepy. The bust on the fireplace staring at me with sightless eyes. The heavy drapes that anyone could hide behind. I have never longed for the generic sameness of the Hilton Garden Inn in my life. And what was on TV when I awoke this morning? The Shining. Oh no — they’re following me. What is it about twins that spooks people? 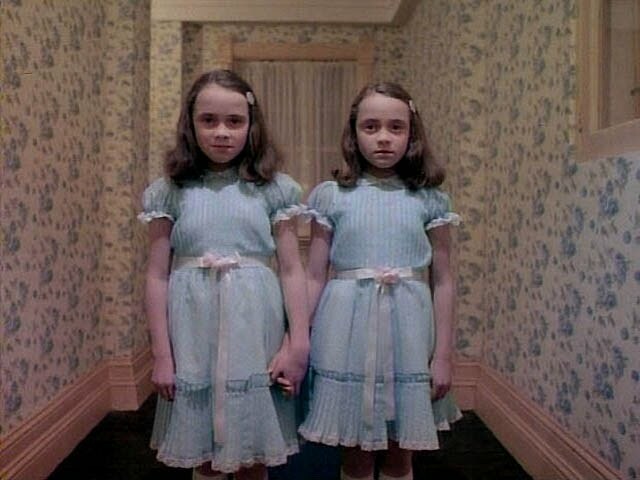 I’m sure you remember the two little girls who haunted the hallways of Stephen King’s classic movie thriller, The Shining. Whenever they appeared, the music changed and bloodshed was sure to follow. Or I think it did. I always watched that part between my fingers. Not to be outdone, the new FX series American Horror Story introduces its ‘twins of terror’ in the very first show’s very first scene. Ginger-headed, the two boys insult a young girl with Down’s Syndrome and then immediately destroy an old, decaying mansion, baseball bats swinging! Clearly they’re not nice people, and are most likely headed for a life of crime…if they live that long, that is. But hey – it’s a horror series. Even if the terror twins die, we probably haven’t seen the last of ’em. Jesus, woman — turn around!